PhD defences have become a bureaucratic formality to torment the candidate and entertain the professors. The PhD Defence is the most important day of the entire program, not. Having been through the process myself, as well as attending about a dozen of other PhD defences, I find that it is considered by the PhD students as one of the most important days in their lives, as if the success or failure of the past four, five, or most likely six years of work depends on how well they do on this special day. Little did they know – their fate had been decided about a week prior to the defence and there isn’t much that could go wrong during the defence, no matter how hard they tried. They discover that you have plagiarized a portion of your dissertation. So unless you are guilty of one of the above 2 item, there is really nothing to worry about. I knew all this before my defence, and I was still as in intense the day before the defence as I ever was. The PhD defence, thus, is a ceremonial events. It is a day to mark and celebrate the completion of a long journey, the end of a student life, the unofficial bestowal of the title “Dr.”, and a day of relief and joy for family and friends. From my personal experience as well as that of several people I personally know, the PhD student — now unofficially a Dr. — actually shares very little of this joy on this day. Overwhelmed by frustration, exhaustion, and confusion, their happiness is only a reflection of the happiness of their close ones. Which is why it is important for family and friends to recognize the significance of their support on this day, preferably by attending the defence. Without this support, without the caring audience, the show brings little joy to the performer. Clarification: the goal of this article is to educate, entertain, and relieve some of the stress that future PhD defenders are going to face. It is not my intention to downplay the importance of the defence in the educational process, except in a humours and sarcastic way. This entry was posted in Reviews on April 25, 2010 by taa. Reasoning about natural language requires robustness in the face of uncertainty about the validity of the information contained in the text. Many natural language processing formalism rely on classical unification, which assumes that the knowledge base is complete and accurate. However, this seldom applies to the real world; text from the Web may contain incorrect, incomplete, or contradictory information. We introduce probabilistic relaxed unification as an alternative approach where the assumptions of classical unification are relaxed. Relaxed unification replaces the binary success or failure outcome of classical unification with a real number quantifying the correctness of the result. Our formalism is realized in the implementation of a modular question-answering system prototype. Our approach is empirically validated through a series of cases drawn from real world questions and data collection. The validation cases substantiate that our system provides satisfactory results on the chosen dataset within the system limitations. 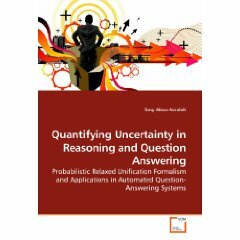 This book should be of interest to academics and practitioners interested in reasoning under uncertainty and automated question-answering systems. I was recently invited by VDM Verlag to publish my PhD dissertation as monograph. The way it works is that the author does all the work for preparing the manuscript, there is no editorial proof-reading or any type of content or formatting assistance. On the other hand, the publisher handles all the distribution and printing at no cost to the author. It’s a good deal if you’re looking for a low-risk (no cost to you) low-return publishing opportunity. The author receives some royalties, but they’re generally insignificant. One significant difference between the book and the dissertation is the addition of an index. Learning about writing an index was both pleasant and frustrating, and it is my hope that the effort it took will prove of use to the reader. If you’re interested in publishing your manuscript through VDM Verlag, let me know and I will make the introduction. Disclaimer: I get a free book for every referral that leads to a publication. This entry was posted in Reviews on October 3, 2009 by taa. I am yet to see a publishing platform that is simpler than posterous. With a single email message containing normal text you create your personal blog and make your first post. No signup, no email commands, no hassles. It’s that unbelievably simple. I didn’t believe it when I heard, so I had to give it a try. Check out my posterous blog. This entry was posted in Reviews on June 28, 2008 by taa.